The Mariachi Ensemble, initiated in the fall of 2012, introduces students to a wide and rich variety of mariachi ensemble repertoire, consisting of traditional and original compositions. Students are coached and expected to develop musical, technical and ensemble-playing skills. The instruments include violin, trumpet, guitar, vihuela and guitarrón; other instruments may be included, depending upon the experience of students. The ensemble is directed by Serafin Paredes, a leading Mariachi educator in San Diego and the founder of the Mariachi Showcase, held each spring at USD. Mr. Paredes completed a Master's degree in Cross-Cultural Teaching, has served as Music Teacher at San Diego High School (MVPA) since 2005, and has been an active music educator in San Diego for 13 years. 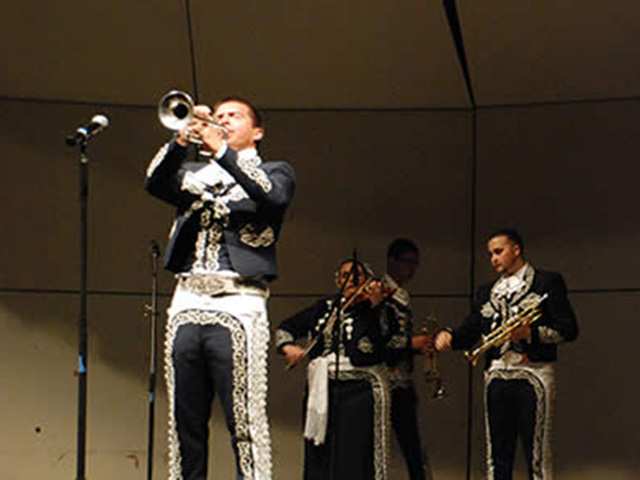 USD students may enroll in the Mariachi Ensemble for one unit each semester, without limit. Three credits will fulfill the core requirement in Fine Arts.